I wanted to say a little more about working on our Islay book. This a project which from the beginning has meant a great deal to me, perhaps because it emerged from a very personal place: the place in which Tom and I were married. The project began as the context for two designs I’d already made – the cardigan and kilt hose we wore to be wed in. At the beginning of the project, this personal connection concerned me slightly. Was there something a little presumptuous about including garments associated with my own marriage in a book? 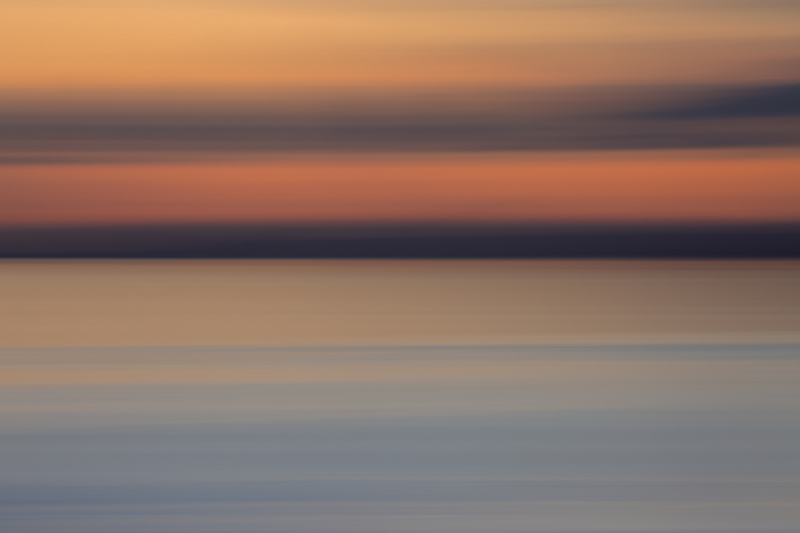 And who, anyway, would be interested in my very personal sense of connection to a particular Hebridean landscape? But as work on the project gathered pace, I saw that those personal connections were precisely what was going to make this book and the designs in it really special. Tom and I first visited Islay fifteen years ago, and had spent part of every subsequent year in and around the island. Without my even really being aware of it, the island had taught me so much it had become a part of me. As I sat down to make my first sketches of the collection I found there was no scrabbling about for ideas: I immediately knew I was going to draw on the history and heritage of the Oa peninsula to create a colourwork allover, I knew the island’s high crosses would be echoed in cables, and I knew that the rainbows familiar to wide Islay skies would feature too. Every project involves some sort of historical exploration for me, and this one took me to places I’d not had opportunity to visit previously. I discovered a profound connection to the work of Islay bards, Duncan Johnston and William Livingstone and learnt much more about the cultural complexity of the medieval western Isles. Then I thought about others I knew who had different kinds of knowledge and expertise, and asked them if they’d like to be involved. With the help of Gordon Yates (Islay wildlife), Anna MacQuarrie (Gaelic in the landscape), Susan Campbell (handcrafts in Islay) and Jane Hunter (Islay geology), a much broader cultural picture of the island started to emerge. I began to see our book as a collective act of map-making: together we were, in our own individual ways, tracing and articulating our own senses of Islay as a place. Through Tom’s photography, through my designs and words, out of Gordon’s forty years of wildlife observation, Anna’s Gaelic connections and Susan’s deep local knowledge we were creating an interpretative record of just some of Islay’s many meanings. And Jane’s contribution literalised this process. Jane transformed her knowledge of, and insights about, Islay’s landscape and geology into a map of Harris tweed. All maps are made things – they are acts of subjective interpretation, not documentary fact – and one of the things I love most about Jane’s work is the way that it brings the made-ness of all acts of mapping to the fore. Jane’s maps are not transparent windows on a landscape: she enacts the particularity of her understanding by literally making it up. So many maps (and maps of this area of Scotland particularly) falsely purport to be objective. There are maps of territory, of ownership; maps that convey an idea of island landscapes as barbaric or exotic, maps that, in rendering the Hebrides peripheries of a distant political centre, erase the important cultural specificity of island populations. Yet all such maps are fabrications: they all re-create a landscape through a series of imaginative claims. So I think it is significant that each of Jane’s maps allows you to see the process behind her acts of making-up, that the very movements of her hands can be perceived in the stitches. Working with Jane, I enjoyed discovering more about her thoughtful map-making process . . .
just as much as I did the finished object. And because Jane’s map was also our map of Islay, created for our book, she made a mark on it for us. On the reverse of the map, Jane stitched a heart at Finlaggan, the place where Tom and I were married. This mark does not represent any sort of claim to this landscape, but it does suggest the profound and respectful nature of our connection to it. In many different ways, I think that this connection was felt by everyone who worked on this project, and that’s why the resulting book feels so special to me. Through this book we’ve made our own map of Islay. This map has been created from number of different perspectives, but each is individual, partial, personal. Our map is in no way objective but I hope it conveys our collective love of, and profound respect for this place, as well as giving a sense of the rich culture and history of the island and the depth of inspiration it affords. Many other maps exist, and there will be many more to come. You can read more about Jane’s geological map of Islay in our book, and find out about her and her work here on her website. If you are interested in maps, and the history and politics of mapping in Scotland, I heartily recommend Christopher Fleet, Charles Withers and Margaret Wilkes beautiful and incisive Mapping the Islands available from Birlinn Press. Thank you for sharing this process. I have enjoyed all of your posts about Islay and can relate to your desire to explore your relationship with this part of the world. Translating pieces of my favorite places into knitting allows me to reflect on my experiences and more deeply understand my connection to our world. It is inspiring to know of other people who use this approach. On a different but related note, I am listening to Landmark by Richard MacDonald, and it makes me think of your writing and photography. Have you read or listened to it? I expect it is one that you would enjoy. I treasure your book and avidly looked forward to your two or more weekly posts. It was your personal relationship with and love of Islay that made the whole project so very special. How particularly nice that the whole was suffused so obviously with the support of family and of friends. Altogether, this made it very heartwarming. I finally opened the package containing my Islay book, and found a wealth of images assaulting my senses and my memories. My second response was a surprise, a recollection of the sounds and scents of the islands. I particularly enjoyed the photos of the wildlife, and the piece on map making. This is an excellent compilation of the experience of the island, not just the yarns and people associated with fibres. Still, if one applies the word ‘fabric’ broadly, you have knit together a fabric of the totality of living on the isles. My book arrived yesterday. Hurrah! It is a thing of beauty and I am going to savour it in small chunks to enjoy my first pass for as long as possible. My mum grew up on Islay and I fully understand your connection to the island. Each time I have visited I see and experience new things even when I am revisiting places I have been. It has been a pleasure to enjoy a project that combines my heritage with my love of knitting and landscape. My mum, sister, and I are off to visit again for a week this summer and I can’t wait. We always visit the two homes my mum grew up in and one of them is largely rubble in the middle of a field. It’s always poignant to trek across the field to see the place my mum was born. Even the remnants of the vegetable garden her father used to tend are still visible. I have always wanted to spend an extended period at the Gaelic language centre to learn a little of my mum’s first language. Even though I was born in Vancouver, I still feel a strong sense of home when I visit the island. Thank you for such a wonderful book. The production values are fabulous! Thank you so much for my copy of Inspired by Islay – I love it. Makes me homesick for the British Isles so much. Keep up the great work – you and your excellent team! I really appreciate your respectful and layered approach to both the landscape itself and the book resulting from your knowledge/experience of it. Congratulations to the whole team on such an inspiring and stunningly executed project! My only disappointment (a minor one) from the book was that the legend for the map is not shown clearly and in its entirety which makes the map a bit more “art” than “map” — well, at least for me, as I´m a geologist :-) Is perhaps possible to find the legend for the map somewhere else than in the book? How pleasantly tremendous! Especially the heart on the back. I love maps and this one is no exception. As proud owner of nearly every publication of yours I am so very excited by Inspired by Isley. It has some of your best work yet and, as always, serves as a beacon in the knitting world we perhaps didn’t know we needed. Thank you to everyone involved at KDD and the gorgeous landscape. I have always loved maps . 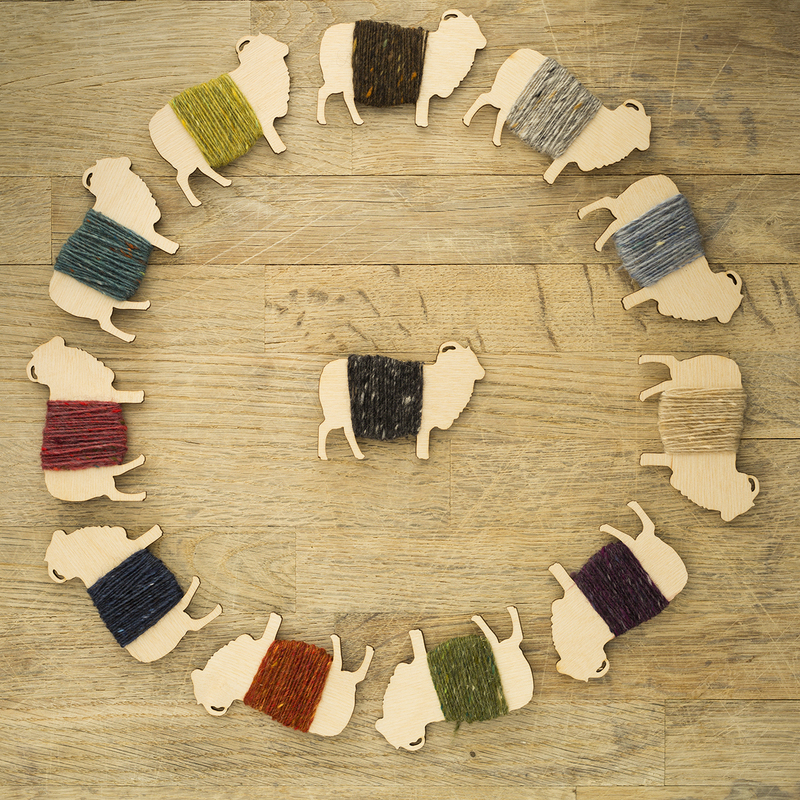 . . this wool map has been such an interesting piece. My book arrived yesterday and it is a treasure to be enjoyed for years to come. I have been fascinated by what connects people to the land around them and it is wonderful to read about others who feel the same way! This post brought tears to my eyes. Connection to place is such a powerful emotional thing and you express it so well and with such a nuanced and thoughtful approach. I look forward to adding this lovely book to my collection. My copy arrived yesterday and it is just Beautiful! I have so enjoyed your weekly posts, patterns and yes, Tom’s recommendations :-) I will enjoy walking through your beautiful landscape from afar. Thank you so much ~ It truly is a project of love! Now I am awaiting my order of your yarn to start my first ever sweater… Finlaggan. Can’t wait! I enjoyed the Islay series so much and signed up knowing that your (collective) interpretation of such a beautiful landscape would be engrossing. Islay is the origin of my husband’s family – they migrated to Australia in the mid-nineteenth century. It still retains its hold on the family imagination and at least one member of every generation has returned to visit. There is a map of Islay in my parents-in-law living room, a distinct fondness for Islay whisky throughout the family and, at the funeral of my husband’s aunt, the song ‘Westering Home’ was played in memory of the father who sung it to his children. We visited years ago on our trek to our lands of origin – Ireland for me, Scotland for my husband – and the landscape of both left its indelible print on our memories. We are planning to visit again and until then, ‘Inspired by Islay’ will remind us of what we loved. Thanks to you and your team for such breathtaking work. What an exquisitely beautiful and inspiring post – many thanks to you & your fellow contributors on the project. I can but dream of visiting that fair isle one day ……. My copy arrived yesterday and, as I tore open the envelope, the smell of fresh copy hit me and I knew I was going to love this work. AND I DO! The essays, the patterns, the photography – all are beautiful. I think if I had to pick one favorite photo it would be of the shadow silhouettes of you, Tom and Bruce. I love this picture because it encapsulates how far you have come, Kate, in your journey. Your healing, your wedding, and the addition of Bruce. I also saw the silhouette of a woman who chose to stand tall when she could stayed down for the count, yet didn’t. I commend you for including the pictures of your wedding in this book, especially sharing the map and the little heart that Jane stitched to represent Finlaggan. The patterns of the cardigan and kilt hose are your “map” of your special day and I thank you for sharing them with the world! I am anxiously awaiting my book……it has been shipped whoo hoo and I agree with the others am happy you branched out and included others in your dream book. Very special…hope you foot has recovered from EYF!! I received my copy of Inspired by Islay. Such a beautiful book, so rewarding. Thank you and everyone who contributed! The map is gorgeous and evocative. I love the collaborative effort and energy that the book communicates, and the little heart on the underside is just sweet. I received my copy of your book just yesterday and took a quick flip through. By page 4 I realized that a flip through to the patterns was just not going to do it for me. Too much history, heart and love had gone into ALL of the book. What surrounds the patterns is not just page filler, but a true love story, not only of you and Tom, but a love of the land and all that it has meant to so many generations. Yes, this book has beautiful patterns in it, but so much more. I know over the next few weeks I will “visit” from my living room, and will be immersed in the love you have for your country and the people you have met along the way. Thank you for introducing me to this magical place. You and Tom are true ambassadors of Scotland, not from a traditional political place, but from a heartfelt love of the country which you convey so eloquently. Thank you for the beautiful book, the beautiful prose, the beautiful patterns, and for letting us enjoy the love you and Tom and Bruce share for each other and the beautiful country you call home. What a perfectly written sentiment – you have touched on all things that make Kate and her crew very special indeed. I will be visiting Scotland in early June and cannot say how excited I am, all the more so for Kate and Tom. “The commonest map of Britain is the road atlas. Pick one up, and you see the meshwork of motorways and roads which covers the surface of the country. From such a map, it can appear that the landscape has become so thickly webbed by roads that asphalt and petrol are its new primary elements. Considering the road atlas, an absence also becomes visible. The wild places are no longer marked. The fells, the caves, the tors, the woods, the moors, the river valleys and the marshes have all but disappeared. If they are shown at all, it is as background shadings or generic symbols. More usually, they have faded out altogether like old ink, become the suppressed memories of a more ancient archipelago. I have been so inspired by Islay I have booked a weeks holiday! So easy to forget that “the map is not the territory” – and such lovely reminders, Jane’s map and your thoughtful prose. Thank you! When we visited Islay in November just over a decade ago, we stopped on the mainland to buy a map, and the lady who served us said that she had worked for many years for a dentist who spent all his holiday time on Islay, and nowhere else. He said that even at that rate, he would never get to know it all. Our visit to Finlaggan was on a misty day. We could see that other people were already there–and they turned out to be a group of travelling friends who were enjoying drams from the nearby distillery, and the playing of a piper they had brought with them. It was a completely magical experience. And I believe the dentist was right. As someone who has worked in the areas of geology and ecology, can I add my voice to the fact that these connections, the layering of meaning that you’ve added to the book, are simply added value in the best use of the phrase. You are not just a knitting designer, but an author, and I remember being told by a creative writing teacher years ago that ‘all a reader wants is to know the author better’- so on that basis, never feel bothered by imbuing your work with your own personality. The. Book is so thoughtful and reflective – I am also reading it in instalments so that it will take longer! Your words are beautifully ‘right’ and not in any way too personal as I love to know the details – it all adds to the connections in life! Thankyou to all of the Team Islay!! Kate, I received my copy of Inspired by Islay just yesterday in the mail. Thank you so much for your beautiful work. Your personal connection to this place and how that connection was articulated by you and depicted in Tom’s images are what, for me, made this book, and your designs, so special. It is the perfect blend of people and place! Inspired by Islay is a very beautiful book, I’m enjoying it very much. The wildlife images are stunning and I love the making of the map….that little heart..!! I love this map, such a beautiful way to interpret the landscape and putting the heart in makes is so special for you. 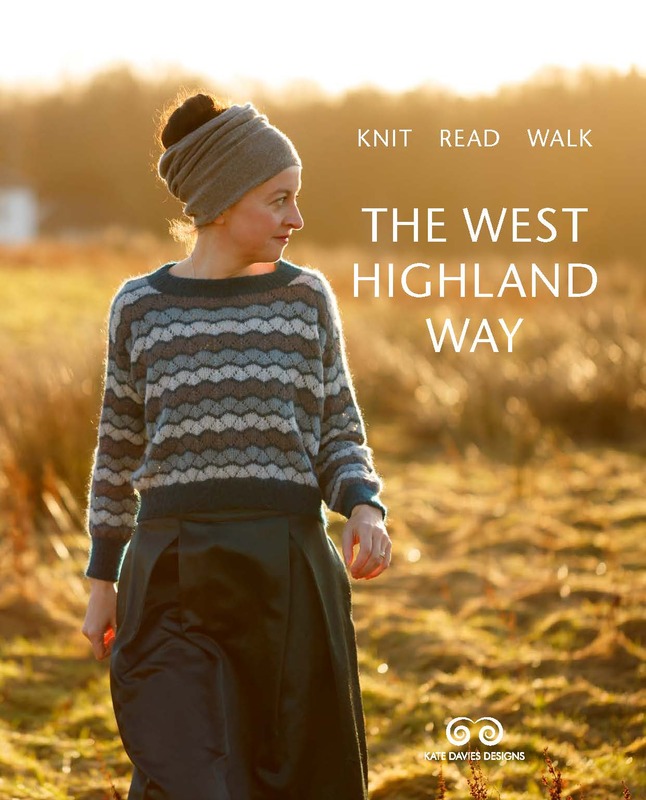 I love my book, the fact that is it personal makes it very special – I love the essays from people who have such a connection to Islay – it lifts the book above other knitting books. Thank you for all your hard work. I love your Islay book and am reading it in little tiny pieces, the better to concentrate on the content and make it “last” longer. Jane’s mapping is my favourite bit, she is so clever and precise and has such a wealth of knowledge. If I had anything like her expertise (just a quarter of it to begin with!) I’d love to try to map the Dorset coast in a similar way, it is geologically very rich.